Manescu is talking about Cole Moran; the 12- year- old boy 47 ABC met Saturday. 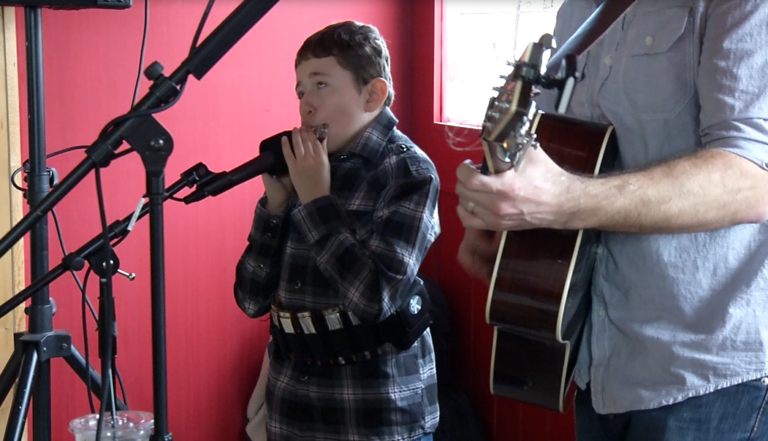 He showed us that despite his blindness and cognitive disability, he can play the harmonica like a pro. Johnny Brooks, the owner of the Crab Cake Factory planned a benefit concert for Cole. He wanted Cole to perform to earn money for more studio time and new harmonicas. However, some thought the benefit wouldn’t happen. Johnny’s father Ron, who’s been referred to as the patriarch of the crab cake factory tragically died Wednesday. Manescu says that’s because Ron, who folks around the restaurant call “Mr.B” would have wanted it that way. He says “Mr. B” always loved being around people. He apparently remembered everyone’s name and we’re told he loved encouraging youth, especially kids like Cole. The energy at Crab Cake Factory was full of warmth while Cole was playing. He definitely warmed the hearts of some who really needed it after a difficult week of grief. For anyone who would like to pay their respects to the Brooks family, the public is welcome at Fenwick Baptist Church tomorrow from 4 p.m. to 6 p.m. and Tuesday from 10 a.m. to 11 a.m.